These pages provide a summary of my family history, which I have been researching for some years. The pages are likely to be 'under construction' for quite a while, as collecting and organising data, and then writing it up, is a time-consuming business. I worked on the project first from 1980 to 1983, in pre-internet days, when my grandparents - a crucial source of initial information - were still alive. I then took it up again 20 years later in 2003, soon discovering how the internet had revolutionised genealogical research. Above is an illustrated summary tree of my ancestry that goes back to great-grandparents only. Below are separate trees of my father's side (which goes back to great-great-great and great-great-great-great-grandparents) and my mother's side (great-grandparents only), and very brief overviews of each family. There is a separate page for each family which provides more detailed history and some more photos. Eventually, I hope to upload more detailed accounts to these pages. NB: Because of issues to do with data storage and confidentiality, these pages do not include detailed information about living family members. I hope at some stage to make those available on additional password-protected pages. My great-great-grandfather Michael Snapper and his sister Bertha Posner emigrated to London from the Posen area of Prussia in the mid-19th century. My great-great-grandmother Sarah Rebecca Leveson's family also seems to have come from Prussia. She married Michael Snapper in London in 1853. Michael and Sarah had 9 children, including my great-grandfather David Snapper, who moved to Nottingham in the 1870s. For further details, click here for the Snapper page and here for the Leveson page. My great-great-grandfather Lewis Karmel and three of his brothers emigrated to Nottingham from Poland in the mid-19th century. He married Elizabeth Goldberg, the daughter of my great-great-great-grandparents Lewis and Hannah Goldberg, who emigrated to Nottingham from Prussia in the mid-19th century. Elizabeth and Lewis had 12 children in Nottingham, including my great-grandmother Minnie Karmel, who married David Snapper in Nottingham in the 1890s. My great-grandfather Lewis Cohen emigrated to Cork around 1900, where he married my great-grandmother Rose Harmel. 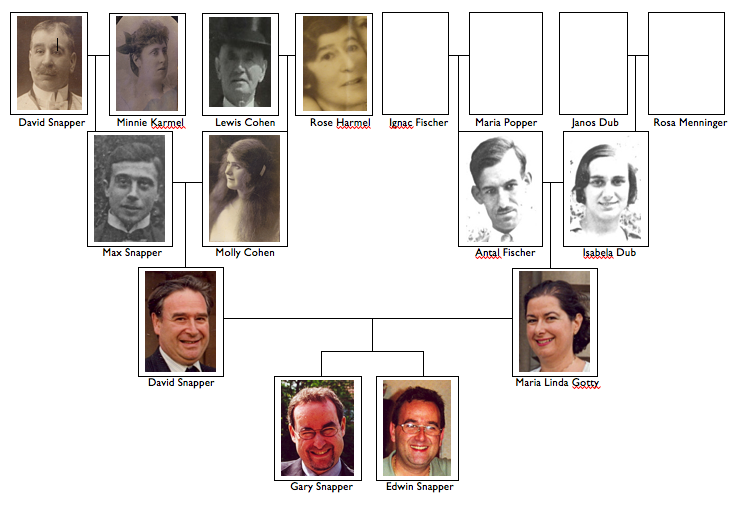 They had 13 children, including my grandmother Molly Cohen who married Max Snapper in Nottingham in 1927. For further details, click here for the Cohen page. My great-great-grandfather Michael Harmel emigrated to Dublin from Lithuania in the late 19th century with his brother Peisa, where he married my great-great-grandmother Hannah Rubinstein, whose family was also from Lithuania. Michael and Hannah had 9 children in Dublin, including my great-grandmother Rose who married Lewis Cohen in Cork around 1900. For further details, click here for the Harmel page and here for the Rubinstein page.